STEVE KNIGHT / JOURNAL Mayor Tim Keller says he hopes to increase the number of businesses in Albuquerque as well as the average wage across the city, among other goals. ADOLPHE PIERRE - LOUIS PIERRE-LOUIS / JOURNAL Mayor Tim Keller says developing the Rail Yards is a crucial component of the " place - making " place-making" area of focus. 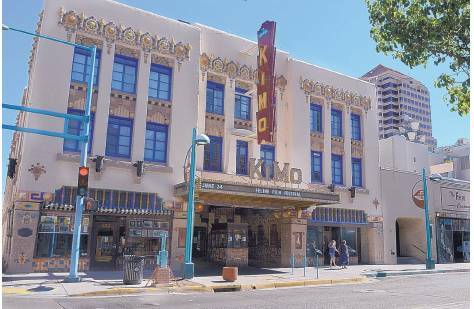 GREG SORBER / JOURNAL The administration plans to make Downtown ' s Downtown's Kimo Theatre a " cre - ative creative hub for the film community." 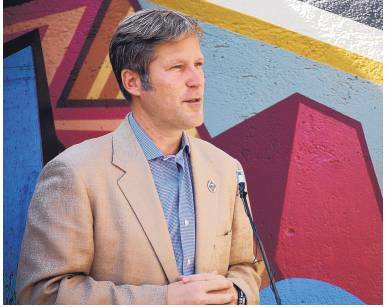 On July 20, at a press conference held at the under-development Glorieta Station site Downtown, Albuquerque Mayor Tim Keller presented his plan to develop the city's economy. The plan comprises six areas of focus - " increment of one," buy local, smart recruitment, creative economy and film, international business and " placemaking " ( see sidebar ) - and covers a wide swath of initiatives aimed at addressing the employment and poverty issues that have long plagued the city.
" They were always trying to land the elephant, always trying to get an Amazon or a Tesla to move here," said Keller." We want to increase opportunities for all types of businesses." The city's director of economic development under Keller, Synthia Jaramillo, echoed that sentiment and said the plan is a reflection of " a whole new culture of collaboration that we're looking to take outside of City Hall." Inc., a not-for-profit that has recruited employers and performed other development activities on behalf of the city under multiple administrations, the plan includes both new approaches and initiatives that build upon on existing infrastructure and strategy. According to AED President Gary Tonjes, the city has agreed to spend $50,000 this year on business recruitment through its contract with AED. Tonjes said the city has made it clear that the recruitment efforts should focus on " a single industry or possibly two." " We're in discussions with his staff about a sector or sectors to concentrate those efforts, but initial conversations have been around directed energy and aerospace," said Tonjes in an email." Historically, the city's $50,000 contract with AED has been in support of a larger group of industries, so the dollars were spread quite thin." Tonjes characterized the economic development strategy of Keller's predecessor, Richard Berry, as one of " build ( ing ) a solid foundation for making Albuquerque the kind of place where entrepreneurs can succeed." The Keller administration, in Tonjes ' view, is " building on that foundation and introducing new strategies, especially those targeted toward local companies and residents." Tonjes said that both Berry and Keller have expressed strong support for AED's Existing Business Development Program, which focuses on providing development services to local companies and was expanded under the Berry administration. Tonjes said the program team may serve as a resource to the Keller administration as the city executes of strategy of replacing some out-of-state vendors with local entities. As for which part of the Keller administration's strategy is likely to be most challenging, Tonjes said international business development can be " a very long game." " It takes a dedicated and consistent effort, properly funded, over the course of many years," he said." Thankfully, there has been some work done in that arena by the city, county and state in recent years on which to build." When asked about the metrics his administration will use to evaluate the success of the plan, Keller pointed to two pieces of data: the number of businesses within city limits, which he said he is interpreting as a measure of entrepreneurship, and average wage rate across Albuquerque. According to the city's Economic Development Department, there are 23,706 businesses in Albuquerque; the average wage rate in Bernalillo County was $913 per week as of the fourth quarter of 2017. The administration is seeking increases in both of those numbers.
" Historically, we've seen the opposite here: fewer companies and wages that are either flat or going down," said Keller." We really want to focus on broad growth." The mayor said he is " taking a risk" by laying out a comprehensive development plan and the rubric by which others- including, presumably, his political opposition- will be able to judge its success or failure.
" We have to move the city forward," she said. 1 INCREMENT OF ONE: Supporting homegrown entrepreneurship and " game-changer " businesses here. One strategy involves creating an initiative similar to the state's Job Training Incentive Program, which reimburses new and expanding businesses for 50 percent to 75 percent of employee wages for up to six months. Additionally, the administration will build upon the existing City Navigator program to create an advocacy office dedicated to serving companies owned by women and people of color, as well as the small-business community. City Economic Development Director Synthia Jaramillo said she will present a draft of the incentive program to the mayor around the end of the year; the budget for the program has yet to be determined. She predicts the advocacy office will be fully staffed and operational by the beginning of next year. 2 BUY LOCAL: Directing more government purchases to local businesses. Keller also focused on this topic during his tenure as state auditor, and in 2017 released a report showing that about 23 percent of New Mexico government contracts were awarded to out-of-state entities. The city says it spends $200 million to $300 million a year on goods and services, with between 70 and 80 percent of those purchases made outside of the state. Under new guidelines, departments are required to evaluate their current contracts and determine which out-of-state deals might be shifted to a local vendor. New contracts subject to the updated guidelines will require at least one bid from a local company. The city has also begun collecting demographic data on vendors using a modified W 9 form, which officials say will help the city establish spending goals with local businesses and those owned by women and people of color. 3 SMART RECRUITMENT: Recruiting businesses to Albuquerque that align with the administration's return on investment strategy. According to the city, economic development incentives will be prioritized for companies that can demonstrate compatibility with the following criteria: leveraging Albuquerque's " core assets" such as its local culture, natural beauty or technological resources; a focus on city locations that have experienced disinvestment; supporting sectors where Albuquerque has a competitive advantage, such as photonics and tribal enterprises; projects that can demonstrate a dependable return on investment; those that bring in money from outside the local economy, creating what is known as economic base jobs; and creating " the right mix of homegrown companies and out-of-state businesses." 4 CREATIVE ECONOMY AND FILM: Emphasizing culture, cuisine, art, music and film as industries key to economic development. Strategies include seeking more direct flights between Albuquerque and California; investigating a fund or grants program for local writers and directors; making the Kimo Theater Downtown " a creative hub for the film community; " creating an exhibit at the Albuquerque International Sunport that showcases movies filmed here; and publishing a code of conduct for productions filmed in Albuquerque. Jaramillo said the city is also planning to relaunch an awards program called Creative Bravos. 5 INTERNATIONAL BUSINESS: Capitalizing on Albuquerque's placement along two major interstates, an international airport and a foreign trade zone to attract foreign direct investment. The city says more effort needs to be expended on attracting small-to-medium sized foreign enterprises. Other plans include an international tourism campaign that targets Mexico and a freight and industry committee at the Mid-Region Council of Governments. The committee is aimed at " allowing private sector / industry input into the transportation planning and prioritization process." 6 PLACEMAKING: Focusing on developing " core city locations" and connections between them, including Downtown, Central Avenue, the area near the intersection of Unser and Coors and the Railyards. 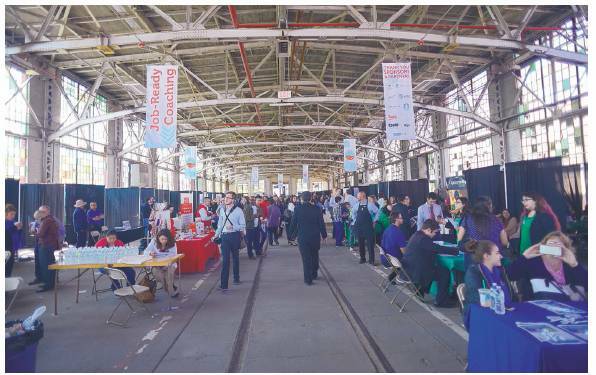 Keller described the Railyards, which is now being used for weekend markets and other events, as " the classic mayor dead-end street" and said the city is committed to addressing the issues that have long plagued the site and prevented it from being fully developed. At a city development commission meeting last month, officials determined the contractor behind the project- California-based Semitaur Constructs-had failed to identify funding for and execute an environmental remediation process for the second consecutive year, thereby giving the city the option to terminate the contract. Keller said the city will have an update on the issue later this month.